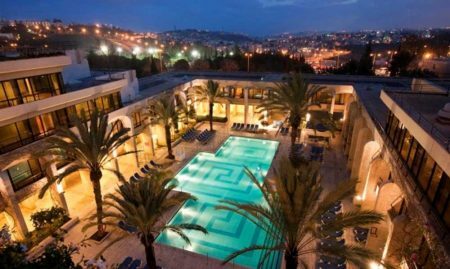 The Commodore is a classic Jerusalem hotel at the foot of the Mount of Olives with modern rooms and amenities and easy access to the Old City by foot or public transportation. We stayed here one night and it was horrible. Found out the air conditioning is wired to a motion detector in the room. As soon as you fall asleep and quit moving it turns the air off and you start to roast. You then wake up and restart it and this cycle of sleeping and waking went on ALL NIGHT LONG. The window was bolted closed. Desk clerk could not override the system. At 5 am the Muslim mosque nearby started their amplified call to prayer. Again no sleep. Breakfast was poor. Much of the food was already gone when we got there. Plus it is in a rough part of east Jerusalem. Manager would not refund our stay. Had to appeal to our credit card which backed and we did get our money back despite the hotels opposition. Let’s start with pros. It is an excellent location, very close to Mount of Olives and only 3 bus stations away from Damascus Gate. Hotel is located in eastern Jerusalem in Muslim district, what is perfect because there is no Szabat here. Friday/Saturday is a normal working day in that area, you can buy food, buses run according to schedule etc. basically Muslim part of Jerusalem lives…and you will get good food here, while the Jewish part of the city is dead for 2 days. Staff is very nice and helpful; even with basic English employees are doing everything to help you, explain things or the way to a certain place. Cleaning service is excellent. Rooms with a balcony have a nice view. Problem is – now some cons – it is a very, very, very old hotel. Walls are actually dirty, WC walls and floor are covered with calcium coating and fungus. Loads of fungus!!! Water is running on the floor. Pipes probably remembering ancient times so the odor from the sink is freakish. Stains everywhere. There is only liquid soap, no shampoo etc. You have no kettle in the room – every time you want some coffee or tea you need to go downstairs to the water dispenser. Buy some plastic cups, because in the room you will find 2 small glasses. Rooms are extremely dark, forget about reading a book ;) In December it is very cold in the room even after they switched on air condition so it is heating up the room 24h a day. It is still extremely cold! In theory, you have wifi here, but with more guests, there is no way you are able to connect to the internet, what I a shame. Breakfast was poor. You can order scrambled eggs or an omelet, it basically what we ate for 1 week, rest isn’t that good. You have no choice of bread, only toasts, some vegetables, and very strange mortadella. It is very poor indeed. You won’t find a scale for your luggage in Commodore Hotel. Hotel is very loud and noisy. There is a TV in the room with Hebrew and Arabic TV stations only. To round up, if you come to Jerusalem for 1 night, then do not hesitate to book a room here, if you planning to stay here (as we did) for 1 week, choose a higher standard hotel. Hotel staff is good & friendly but rooms are too small with limited utilities & small bathroom. Lights are not sufficient & feel dark in room as well as in bath. Bath towels are provided in sufficient quantity, no kettle, tea coffee etc are provided. Breakfast & dinner are good with very limited items to choose.